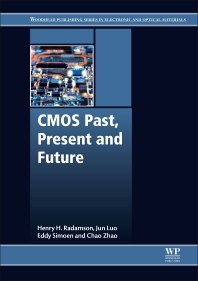 CMOS Past, Present and Future provides insight from the basics, to the state-of-the-art of CMOS processing and electrical characterization, including the integration of Group IV semiconductors-based photonics. The book goes into the pitfalls and opportunities associated with the use of hetero-epitaxy on silicon with strain engineering and the integration of photonics and high-mobility channels on a silicon platform. It begins with the basic definitions and equations, but extends to present technologies and challenges, creating a roadmap on the origins of the technology and its evolution to the present, along with a vision for future trends. The book examines the challenges and opportunities that materials beyond silicon provide, including a close look at high-k materials and metal gate, strain engineering, channel material and mobility, and contacts. The book's key approach is on characterizations, device processing and electrical measurements. Henry H. Radamson received an M.Sc. degree in physics and the Ph.D. degree in semiconductor materials from Linköping University in Sweden, in 1989 and 1996, respectively. In 1997, he joined the Royal Institute of Technology in Stockholm as a senior scientist, where he has been an Associate Professor since 2001. Dr. Jun Luo joined the Institute of Microelectronics of Chinese Academy of Sciences (IMECAS), Beijing, China in August, 2010. His current research interests cover the CMOS technology, Si/SiGe devices and process technology, energy harvesting devices based on Si technology and GaN-on-Si HEMTs. Dr. Zhao is a research professor and the Director of Integrated Circuit Advanced Process Center of IMECAS (Institute of Microelectronics of Chinese Academy of Science). In 1982, he graduated from Physics Department of Nanjing University in China with a Bachelor Degree. He received a master degree from University of Industry of Harbin in Semiconductor in 1988 and a PHD degree from Katholieke University of Leuven in Belgium in 1999. Between 2000 and 2010, he was working as a senior scientist in IMEC and took part in IMEC IIAP program on High-k, Cu connection, Cu contact and TSV 3D IC. His research experience and interest covers both FEOL and BEOL processing technologies in 8-inch and 12 inch pilot lines. He has authored and co-authored 130 scientific papers and has filed more than 80 invention patents in IC processing technology.